ANZUK Ordnance Depot 1971-1975 | "To the Warrior his Arms"
The ANZUK Ordnance Depot was the Ordnance component of the ANZUK Support Group supporting the Singapore Based ANZUK Force from August 1971 to September 1974. The last of several post-war Commonwealth Ordnance Depots, the ANZUK Ordnance Depot was comprised of service personnel from the RAOC, RAAOC and RNZAOC, supported by a large complement of locally employed civilians. The ANZUK Ordnance depot was located in the premises vacated by the Royal Navy Victualling Depot on the dockside at Sembawang Naval Base. During its short duration as a unit, the Depot had four Commanding officers, two from the RAOC and two from the RAAOC, it was planned to rotate the command amongst all the nations, but the Depot would close before New Zealand had the opportunity to command. ANZUK Ordnance Depot, Commanding Officers Aug 1917-Mar 1975. Robert McKie collection 2017. Command of the Subunits was a shared by the three counties with New Zealand officer Captain Ian Ross commanding the Vehicle Sub Depot in the early years of the Depot. The initial stocking of the ANZUK Ordnance depot was achieved by the transferring of stocks from the soon to be closed 3 Base Ordnance Depot, RAOC and from 5 Advanced Ordnance Depot, the combined Australian and New Zealand Ordnance depot established a year earlier. In 1972 the depot had a stock holding of around 45000 line items spread over the different sub-depots. The cost management of the force was on a percentage basis, 40% each for the United Kingdom and Australia with the remaining 20% of costs picked up by New Zealand. The reimbursement process was very complicated and managed by the ADOS staff in HQ ANZUK Support Group. All stock received into the Ordnance Depot was costed, billed with the reimbursement arranged with the participating countries as items were issued. National billing was only affected for principle items such as vehicles, controlled stores, major unit assemblies and the like, and reimbursement would only be made if the items were issued to a national unit (e,g, 1RNZIR). This resulted in 1RNZIR demanding routine stocks from the Depot at no extra charge, but if major items were issued New Zealand would only pay 80% of the cost. 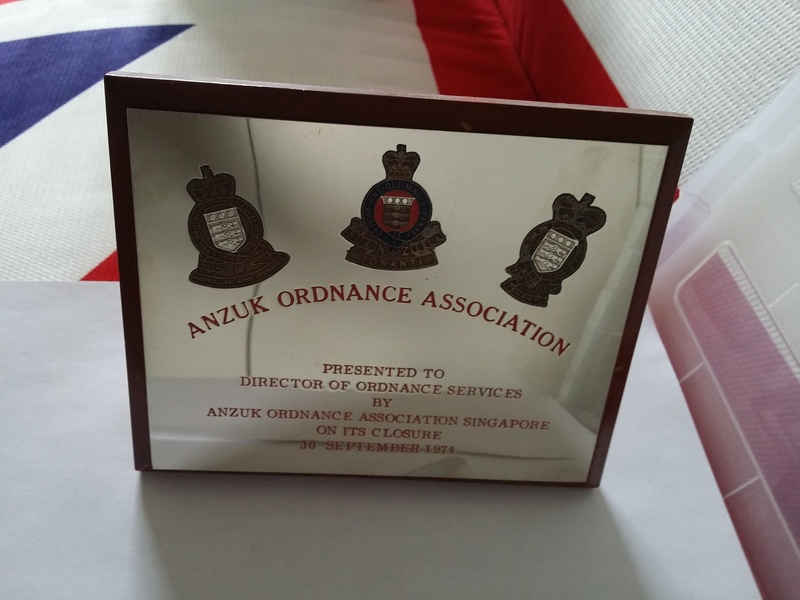 There was no cost involved when an item was issued to an integrated ANZUK unit. Troops from contributing nations wore their standard national uniforms with the addition of the ANZUK Force patch, which was worn on each shoulder. ANZUK Force patch. Robert McKie Collection. By 1973 the political climate was changing in both Australia and the United Kingdom, and the ANZUK force days were numbered. By mid-1974 the remaining British element had split and became RAOC Ordnance Services Singapore for the duration of the final British Withdraw. The New Zealand component of the ANZUK Force would become New Zealand Force South East Asia, with the New Zealand Advanced Ordnance Depot coming into being on 31 January 1974 and the ANZUK Ordnance Depot ceased to exist on the 30th of Sept 1974. By 1977 NZFORSEA was the sole remaining foreign presence in Singapore until its departure in 1989. This entry was posted in Cold War, Singapore, South East Asia. Bookmark the permalink.